There is no complaints from us! Room was cleaned everyday we asked, view from the balcony was breathtaking. The hotel couldn't have a better location. It's right on the beach with easy access. The view and breakfast was very good. You can possible see dolphin s from the lounge. Great location, great beach, the rest was average, amenities lacked. Somewhat disappointing for the $$. Overall was a good experience. Only issue was they didn’t come by to clean our room on the last day we were there. Nice and new hotel. Hotel staff was courteous by not friendly at all. I would suggest the hotel give guest info upon check-in on things like process of getting beach towels, breakfast hours, process for entering pool and beach area, and the cost and information on renting beach chairs and umbrellas. It would help if this info were printed and placed in room upon check-in. The hotel and room were great! Enjoyed our stay. Nice hotel on a beautiful beach! Loved eating breakfast looking out over the ocean. The hotel needs to be renovated, the facilities are clean but not 5 ***** Acces to the beach was great, pool hours were perfect , heated pool is a plus. Housekeeping not that great , they cannot make a bed right. Very polite though. Location is great . Not a bad place to stay but not worth $300 + per night . Only downside was having to change rooms. The first room we checked into had a bad smell (as if a pet had been in a non-pet room) which triggered my severe allergies and the AC was extremely loud so the first night was not very comfortable after driving 10 hours to arrive at our destination. We were moved to another room the next day which was much better but nothing further was done for the inconvenience. The view from the lobby is amazing and free breakfast is great! The staff was exceptionally friendly. Being a few steps from the beach is another bonus!!! Awesome stay ,we really enjoyed the experience! Three of us friends were there to celebrate one our 65th . Unfortunately the weather was not good to spend time on the beach , BUT, we ( and especially our dear friend who badly needed this getaway) TOTALLY enjoyed our stay. And , it was convenient to great restaurants. Our breakfast at BEST WESTERN was EXCELLENT !!! Everything from check in to check out was great. This hotel is beautiful, the workers are very nice and friendly and the location is perfect! 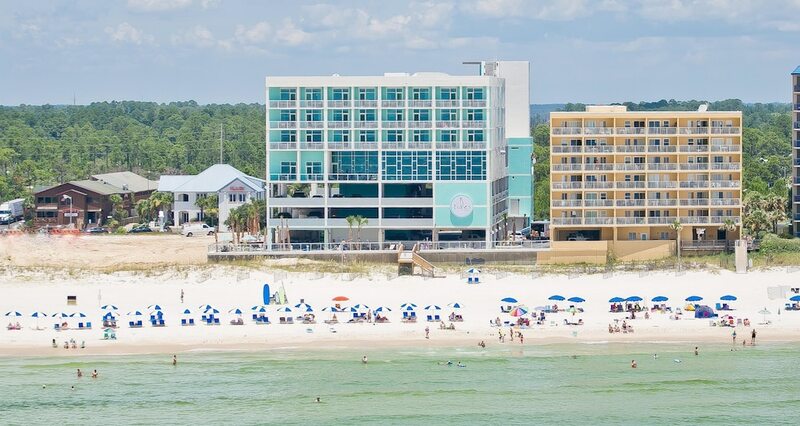 Best Western Premier The Tides places you within 2 miles (3 km) of Orange Beach Indian and Sea Museum and Adventure Island. This 86-room, 3-star hotel welcomes guests with conveniences like an outdoor pool, free in-room WiFi, and free self parking. Start your day off right with a free full breakfast offered each morning. At the end of the day, unwind with a drink at the bar/lounge. A flat-screen TV comes with satellite channels, and guests can stay connected with free WiFi. The bathroom offers hair dryers and free toiletries. Other standard amenities include an iPod dock, a refrigerator, and a microwave. Built in 2016, the brand new Best Western Premier The Tides offers an outdoor pool, a fitness center, and a spa tub. If you drive, put free parking to good use. The front desk is staffed 24/7 to help with luggage storage, and answer any questions about the accommodations. Other amenities at this beach hotel include free WiFi in public areas, a meeting room, and a 24-hour business center. Thank you so much for your five-star review! We love that you love us. It's great to hear you were happy with everything about your stay, especially our the live music at the pool area, easy beach access, and the amazing staff. We are thrilled that we helped make your stay a great one and we'll gladly welcome you back to join us again for more fun in the sun soon! Thank you so much for your excellent review! We are so glad you enjoyed your stay and loved our facility as well as your spacious room and our beautiful beachfront location. We are thrilled that you and your family had a nice stay and we can't wait to welcome you back to feel the sand under your toes for your next trip! Thank you so much for your outstanding rating! It's great to hear you were happy with just about everything during your stay. We are thrilled that we helped make your stay a great one and we can't wait to give you a warm welcome back to our little slice of paradise on your next vacation! Thank you so much for sharing your five-star review with us! We are so happy you enjoyed your stay with us and appreciated the your clean room and your Gulf-front view from the balcony. We're so happy you had a wonderful time and we look forward to welcoming you again for more sunny skies at the Tides in the future! C, we're so glad you enjoyed your time with us and our beachfront location. We hope to welcome you back for another 5 out of 5 stay sometime soon! Greg, thank you so much for your nice review! We are so happy that you enjoyed your stay and loved our beachfront location with the beautiful view from the lobby. You are correct, you can watch the dolphins play from there. We are glad that we helped make your trip an excellent one. We will be happy to welcome you back on your next vacation! Thank you for taking the time to share your experience with us. Our sincere apologies for your room's towels and linens. Your valuable feedback matters to us as it helps us do our job better. Please feel free to give us a call should you wish to discuss this matter further. Thank you for choosing to stay with us and we hope to see you again in the future. Thank you so much for your five-star review! We love that you love us. We are thrilled that we helped make your stay a great one and we can't wait to welcome you back to our little slice of heaven on your next vacation! Thank you so much, Reginald, for your nice review! We are so glad you enjoyed our beachfront facility, the complimentary breakfast, and the tasty adult beverages. We are so sorry to hear about the issue with housekeeping. Your opinion truly matters to us as it helps us run the business better as well as to serve our valued guests properly. We are glad you had a nice stay regardless, and we hope to welcome you back to make it up to you. The hotel has an outdoor pool and a spa tub. A fitness center and complimentary bicycles are other recreation options. The preferred airport is Pensacola, FL (PNS-Pensacola Intl. ): 53-min drive, 30.3 mi/48.8 km.